Students can soon attend readings and workshops with published writers. Millikin’s Literary Festival or “Lit Fest” is entering its sixteenth year. From November 9-10, writers Chris Fink and Mark Wagenaar will visit campus to work with students. Fink, a professor at Beloit College and author of “Farmer’s Almanac,” will lead a workshop and craft lecture on fiction. Wagenaar, a professor at Valparaiso University and author of “Voodoo Inverso,” will lead a workshop and lecture on poetry. Students are encouraged to attend the event and participate in the workshops, lectures, and readings. More information can be found on the English department’s page at millikin.edu. Interested students can also contact the English department to learn more. The event will begin with a reading by Fink on Friday, Nov. 9 at 7 PM in Pilling Chapel. A reading of “Collage,” Millikin’s literary and fine arts magazine, will follow. On the morning of Saturday, Nov. 10, students can attend either a fiction workshop with Fink or a poetry workshop with Wagenaar. These workshops will be held in Shilling Hall. In the afternoon, Fink and Wagenaar will deliver craft lectures in Pilling Chapel. There will also be a reading by Millikin faculty and guests. A reading by Wagenaar will follow this. The event will end with closing remarks on Saturday night. Millikin students are encouraged to attend. Roughly 20-30 high school students also attend the festival each year. Some students drive for hours to come to campus for the event. The Millikin English department also sponsors a writing contest for high school students. In the past, typically 80-150 high school students submit works of poetry or prose to be considered for the contest. The winners of the contest will be announced at the end of the day on Saturday, Nov. 9. Millikin’s English department hosts this event every fall. Every year, they invite two published writers to campus to share their writing and advice with students from Millikin and nearby high schools. 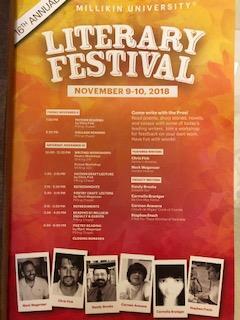 The writers give workshops, lectures, and readings at the festival. They help students generate and improve their work. Fink and Wagenaar have both published multiple books of work, and they have won awards for their writing.